It’s Time to Pick Up the Phone! New business is the life-blood of your business. 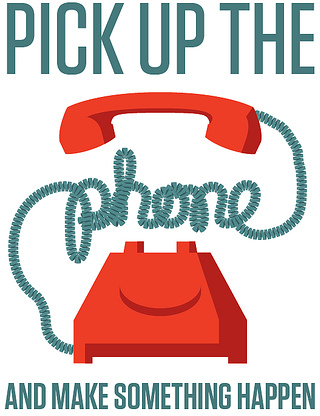 I highly recommend that you take the time to proactively promote yourself on a daily basis by picking up the phone. It is amazing how effective it can be to identify a potential prospect on Linked In. Pick up the phone and make the call. Your business will be enriched and you will strike gold sooner rather than later! In our culture, the highest rewards do not go to the hardest working, most intelligent, or best prepared. The highest rewards go to those people who are most willing to promote themselves. If you reach for the phone and stop, immediately write down what is causing you to stop. There are four energy blocks that keep people from proactively promoting themselves: limited beliefs, assumptions, perspectives/interpretations, and your inner critic. Your freedom from Sales Call Reluctance (fear of promoting yourself) begins when you identify what is causing you to stop. Once you identify the internal obstacle, you can challenge it and shift it. Working with a good coach can help you learn how to shift from internal obstacles. Connie Kadansky, MA, PCC is a Sales Call Reluctance Coach and Trainer, helping people get their “ASK” in gear! She offers speaking, training, coaching and performance improvement services specifically addressing Sales Call Reluctance. She has a proven track record with diverse businesses, from entrepreneurs to Fortune 50 companies, nationally and internationally. Call her at 602-997-1101 or visit www.exceptionalsales.com.